The brilliant burst of neon blue and green that hugs the shore of Namibia in this photo-like image might be beautiful from space, but it is deadly on the ground. The color is caused by hydrogen sulfide erupting to the surface. The foul-smelling gas is toxic by itself, but it also robs the water of oxygen when it erupts to the surface, leading to large fish kills. Ironically, it is the ocean’s productivity in this region that causes the deadly eruptions. 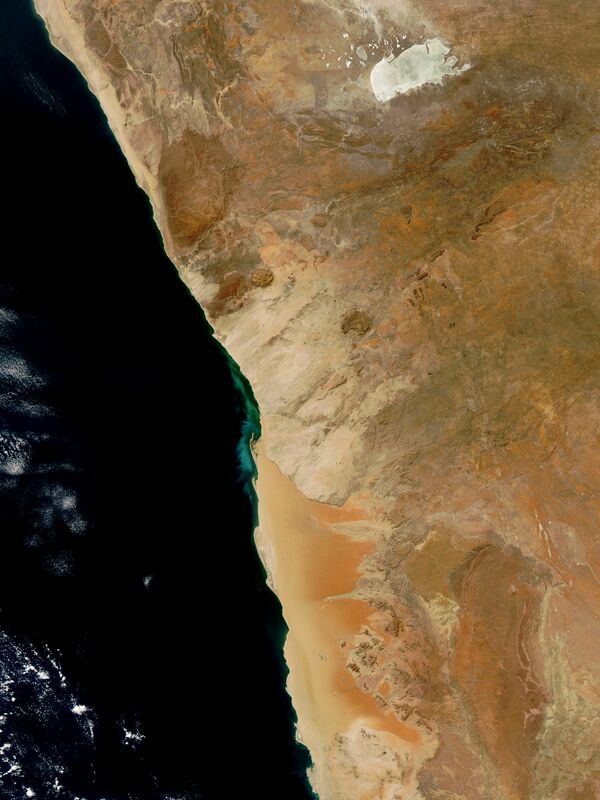 Strong ocean currents sweep nutrient-rich water to the sunlit surface of the Atlantic Ocean off the coast of Namibia. The ample supply of nutrients allows tiny free-floating plants (phytoplankton) to proliferate. When the large phytoplankton blooms die, the plants sink to the ocean floor, where bacteria break them down. The anaerobic bacteria that complete the decay process release toxic hydrogen sulfide into the ocean. The gas builds near the ocean floor until a bubble erupts to the surface. As it rises, the hydrogen combines with oxygen to form water molecules, leaving solid, yellow sulfur. The sulfur scatters yellow light, lending the water a brilliance that can range from milky white to electric blue. 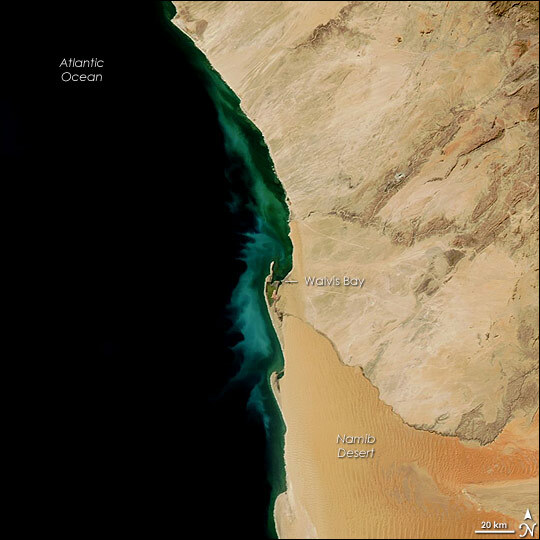 This particular eruption surrounds Walvis Bay and stretches north along the Skeleton Coast and south to the orange dune fields of the Namib Desert. The city of Walvis Bay is a faint gray discoloration on the southern shore of the bay. The Moderate Resolution Imaging Spectroradiometer (MODIS) flying on NASA’s Aqua satellite captured this image on July 25, 2007. The large image provided above has a resolution of 250 meters per pixel. The MODIS Rapid Response System provides the image in additional resolutions.